A NEW gin being built as a joint venture between Southern Cotton and Queensland Cotton in Coleambally is still on track to open next year, but is not expected to be fully operational for the start of the 2020 ginning season. Southern Cotton chair Larry Walsh and Queensland Cotton executive general manager John Robinson. “We were hoping to open in time for the start of ginning in 2020, and we were hoping to be scheduling the project now, but we’re waiting on finalisation of approvals related to the Environmental Impact Statement,” Southern Cotton general manager Kate O’Callaghan said. The gin will be the southernmost in Australia, and will supplement capacity at Southern Cotton’s existing gin at Whitton, between Griffith and Narrandera. 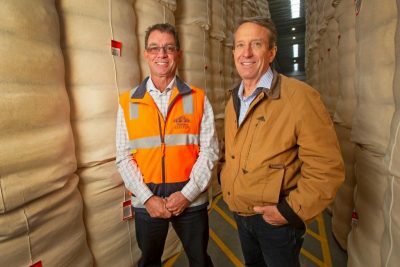 It will also mark the first foray into southern NSW for Olam International’s Queensland Cotton. Queensland Cotton operates gins at Cecil Plains, Dalby, Emerald, Moura and St George in Queensland, and Collymongle, Warren and Wee Waa in northwest NSW. Apart from Southern Cotton’s Whitton gin, cotton ginning capacity in southern NSW comes from Auscott at Hay, Namoi Cotton at Hillston, and Rivcott at Carrathool. Bayer regional business manager for southern NSW Luke Sampson said growers were now starting to defoliate cotton, and picking was expected to start in about four weeks. Mr Sampson said the southern NSW area to be picked is made up of 44,000 hectares in the Murrumbidgee Valley, 13,000ha in the Lachlan Valley, and 3000ha in the Murray Valley. He said a small area of cotton lost to hail early in the growing season would make a minimal reduction to planted area, and water rather than price outlook looked like being the limiting factor for area planted to cotton in spring this year.